Disclaimer: Please discuss all dietary changes and supplements with your healthcare provider before making changes. Each of us has different health factors and conditions that make us unique. Only your healthcare provider can safely guide you to appropriate solutions for your IBS. I want to say that I’ve found a cure for my irritable bowel syndrome (IBS), but I haven’t. I’ve identified some foods that definitely make it worse. I’ve found some things that help. Everyone’s body is different and what works for me may not work for you and vice versa. So here is what I’ve learned. The primary results of the elimination diet is that wheat and dairy products are not my friend. Eating these things causes belly pain and gas. So, I’ve been trying to eat gluten and dairy free. However, wheat is in so many places you don’t even know about. It’s in my onion powder and chili powder. Why?? I don’t know. I need to read every label and it’s a pain, but if I don’t read labels, I wonder why my GI track is screaming at me. When I eat rye flour Wasa crackers they don’t seem to bother my belly, so maybe I’m not gluten sensitive, just wheat sensitive. I’m finding it hard to figure out. The only way to do so is to go gluten free for a month and then re-introduce rye and see what happens. I have not been able to tolerate milk for many years, but I thought cheese was okay. I seem to get by with a small amount. Maybe I need to cut it out as well to give my system a chance to heal. So, I’m in the process of finding substitutes and options. Thankfully there are tons of resources online to help, including recipes. My physician had given me permission to try to get off my acid-reducing medication, Prilosec. Previous attempts had resulted in 24 hour heartburn. This time I added digestive enzymes to my meals, and found that when I avoid foods that make my distress worse, and add digestive enzymes that my symptoms of indigestion and heartburn are greatly reduced. Dr. Liptan encourages the use of products with stomach acid in the form of betaine hydrochloric acid in the ingredients UNLESS you have stomach ulcers. So don’t use products with betaine hydrochloric acid if you have ulcers as it will make your ulcers worse. The product also needs to contain the pancreatic enzymes of lipase and amylase. I had found that before I started my elimination diet, that my pain medication (an NSAID) was wrecking havoc on my stomach even though I was taking it with food. My rheumatologist had said that I could take 1-2 tablets twice a day. First, I cut the dose down to one tablet twice a day. I had slightly more overall pain, and my stomach felt better for awhile. That didn’t last long, though. With my primary care doctor’s okay, I started using turmeric capsules and quit my NSAID. To my surprise, the turmeric worked as well as the NSAID for me without the stomach distress! Dr. Liptan also advises limiting NSAID intake. Check with your doctor before trying turmeric capsules, as there are contraindications. If you would like more information on turmeric you can click here. Dr. Liptan also recommends taking a daily probiotic. She also encourages switching products every couple months to give ourselves different probiotic bacteria. I take a daily probiotic, but I don’t notice any benefit since I’ve been doing so for several years. If you’re bothered by diarrhea or take frequent antibiotics you will probably notice a lessening of symptoms by taking probiotics. Another supplement that she uses with her patients is L-glutamine. “L-glutamine, (is) an amino acid that’s the primary fuel for the cells of the small intestine.” It “has been shown to reduce gut leakiness.” She recommends 500 mg three times a day for two months along with probiotics. I have not tried this yet for two reasons. 1. I haven’t had a chance to run it by my doctor, and 2. it turns into the same compound as monosodium glutamate (MSG) does in our bodies. I try to avoid MSG because it makes my asthma worse, so I’m not sure that this supplement is a good idea for me. This is why we need to educate ourselves and ask our doctors. Just because these things are available over the counter, doesn’t mean they’re safe for every person. You can learn more about L-glutamine here. If you’re dealing with irritable bowel syndrome, there are some things that you can do yourself to ease this condition. Consider doing an elimination diet. It’s considered to be the best way to identify foods that make your symptoms worse. Try digestive enzymes with meals and snacks. They have been a great help to me. Talk to your doctor about any supplement you want to try. Research your condition, and any suggested treatments before you talk to your doctor. Try to eat your meals in a relaxed state. Stress interferes with digestion. 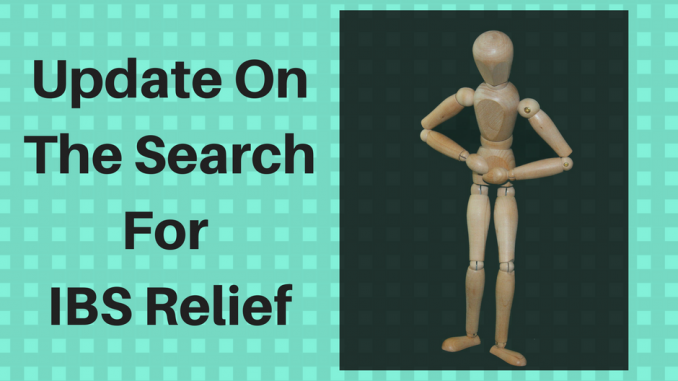 I hope this information helps you as you search for solutions for your IBS. If you would like to receive updates and Freebies in your inbox, you can sign up with the form below. I had to decrease the turmeric to every other day. I got a broken blood vessel in the white part of my eye. I bruise really easily even without the turmeric. I’d check with your doctor before using it, just to be safe. I haven’t noticed any itching. While I’m not having any more broken blood vessels, my pain is worse. It is such a challenge to fine tune what helps with preventing unwanted side effects.